When Apple released the iPad mini with Retina display, some people were disappointed because it was slightly thicker than the original. That meant it was probable that many accessories for the original wouldn’t work with the newest model. 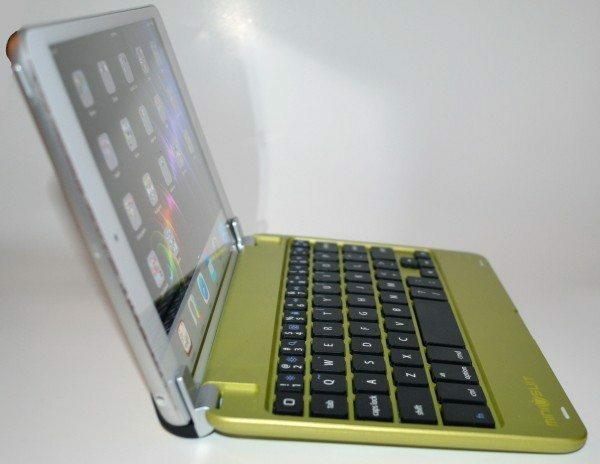 That’s not the case with the Minisuit Bluetooth QWERTY Keyboard Stand Case for iPad mini 1 & 2. I no longer have the original iPad mini, but I can vouch that this keyboard case fits the new, thicker iPad mini with Retina display. Let’s give it a closer look. 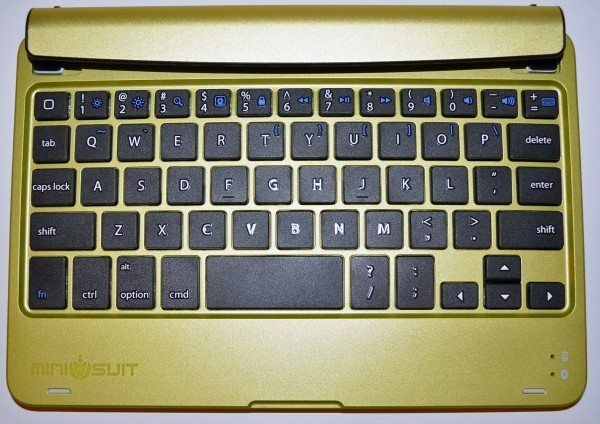 I received the Minisuit keyboard case in a yellow/chartreuse color that doesn’t seem to be available any longer. The only branding on the keyboard is the tone-on-tone Minisuit logo at the bottom left. 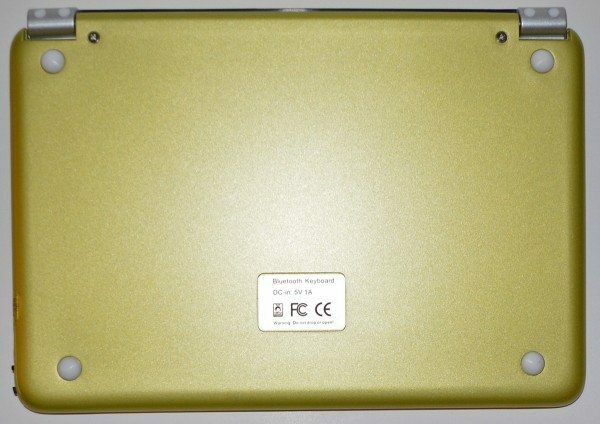 Two little rubber bars (under the logo and on the right) lift your iPad’s screen slightly to prevent it from being scratched by the keys when you close the case. The keyboard looks like anodized metal, but I think most of it is actually colored plastic. The solid, arched piece along the top is part of the hinge. That’s actually the entire “back” of the keyboard case. The other side of the hinge consists of two small metal “fingers” that fit over the top and bottom bezel areas of the iPad. They are well out of the way of the touchscreen. The inside of the hinge is lined with a black, velvety material to protect against scratches on the iPad. There aren’t a lot of specifics about this keyboard to be found at Minisuit’s website. 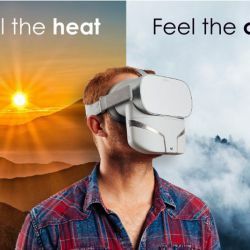 It does have a rechargeable battery (4-5 hours for charge) that Minisuit says gives you about 60 days of standby time and about 55 hours of typing time between charges. It measures 7.25″ X 5.5″ X about 0.75″ thick at the hinge. It weighs 8.5 ounces on my digital kitchen scale. It adds significant bulk to the iPad mini. Just like all of these undersized keyboard for tablets, this one has a non-standard keyboard layout. A quick comparison to the keyboard on your computer will show you that none of the punctuation keys are where you expect them to be. Some have been moved down to the spacebar line, making the spacebar too short; others are now function keys on the top row of letters. 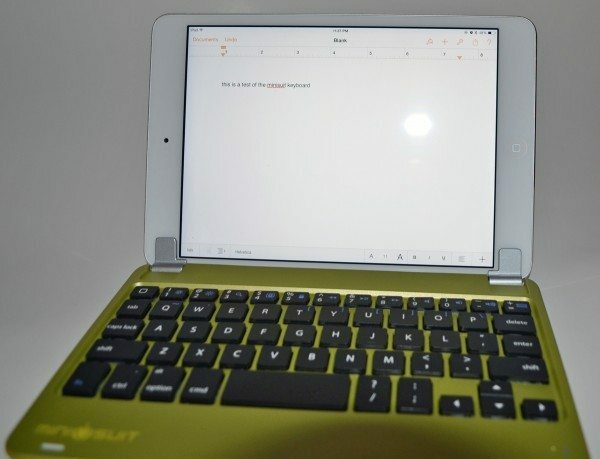 Just like most of these tablet keyboards I’ve seen, the Minisuit incorporates function keys designed for the iPad mini, but they don’t have their own row above the number keys. Instead, they are functions on the number keys. The right side of the keyboard has a standard microUSB port for charging. A USB-to-microUSB cable is included, but there’s no power adapter. The slider switch is for power, and the push button puts the keyboard into Bluetooth pairing mode. The keyboard paired easily with my iPad mini with Retina display, but I did need to enter a pairing code on the keyboard. 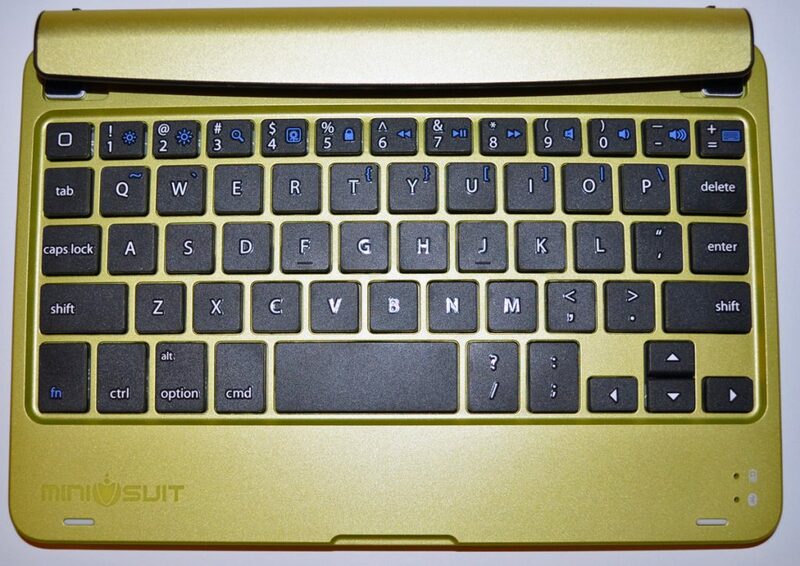 The other side of the Minisuit keyboard looks like the bottom of a laptop, with non-skid feet and a product label. Here’s my iPad mini in the “open laptop” position. This picture shows the hinge open to the maximum position. I’m short, so this wasn’t a bad angle for me for viewing the screen, but taller people may have a harder time seeing it. The keys actually have a nice feel and give good feedback when they are pressed. The keys are all smaller than standard keyboard keys, so they are harder to fit your fingers on for touch-typing. The F and J keys (home keys for touch-typists) have a raised bar to let you know when your hands are in the correct positions, but the non-standard size and placement of the keys makes touch-typing extremely difficult because my fingers felt too close together, and I often over-reached when trying to type nearby keys. The space bar is too short, so I often ended up missing it or typing a / instead of getting a space. With some practice, it was easier to type letters and spaces, but I couldn’t do punctuation without having to take my hands off the keyboard and hunt for the key I needed. If you are a hunt-and-pecker, you’ll certainly find that the Minisuit keyboard gives better physical feedback than the on-screen keyboard, but touch-typists won’t be quite as satisfied. This is the back of the Minisuit case with the iPad mini in place. 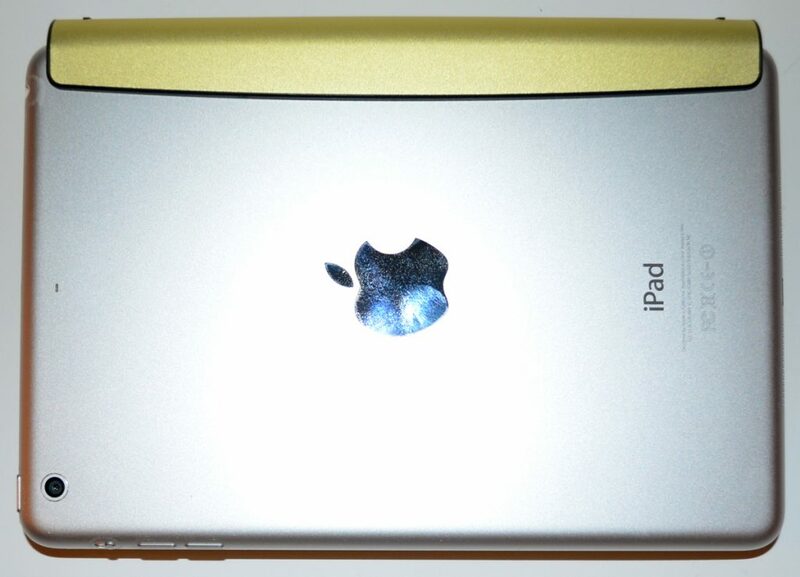 You can see that it leaves almost the entire back and three sides of the iPad mini uncovered, so it certainly doesn’t interfere with using any of the buttons and ports. However, it does leave the back of the iPad vulnerable to scratches, bumps, and bangs. I did feel that the hinge gripped the mini with Retina display snugly, so I didn’t worry that the iPad would fall out. The case has magnets that activate the mini’s sleep/wake functions. 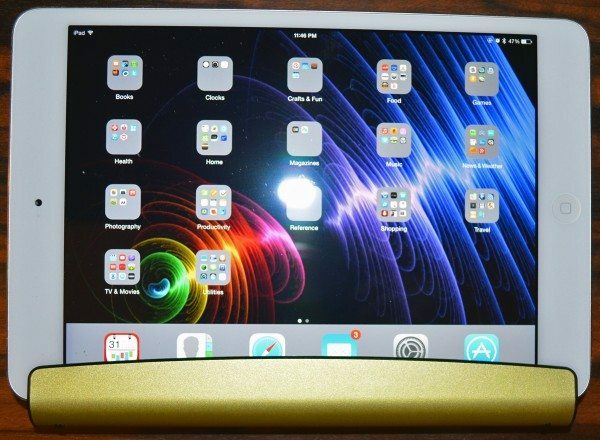 You can see in the above photo that the iPad isn’t held snugly against the edge of the Minisuit cover. I was afraid that this gap might be big enough that the iPad would wake back up, but I didn’t notice that happening. You’ll remember the earlier image that showed the maximum open angle for the hinge, so you can guess that you can’t fold the iPad completely back for one-handed holding. You can flip the iPad over and slide it into the hinge, as shown above, but the hinge does cover a significant amount of the touchscreen. It made it harder to use the icons on the iPad’s dock, and it made it impossible for me to swipe up to activate the Control Center screen. Both touch-typists and hunt-and-peckers will appreciate the tactile feedback of this keyboard, but you won’t be able to actually touch-type successfully because of the undersized keyboard, undersized keys, and non-standard arrangement. The iPad-specific function keys mostly performed well, but I never could get the photo slideshow key to function. The restricted hinge doesn’t allow the case to be opened far enough that you can comfortably use the iPad like an open book, and the size and weight makes it harder to keep one hand free for interacting with the screen in the book configuration anyway. You can flip the iPad over and slide it into the hinge with the screen facing up for one-handed holding, but the hinge covers part of the screen in this mode. I’d just use this as a travel Bluetooth keyboard; I’d keep it in my bag until I needed it for taking class or meeting notes and use my iPad uncased the rest of the time. Just to add…I used this with a Dell Venue Pro 8 and, though it wasn’t a perfect fit, worked flawlessly. Definitely worth the small price from Amazon. This seems a much better design to one I reviewed for the iPad Air just recently, although I rather liked it for it’s usability it only lacked in some minor points. 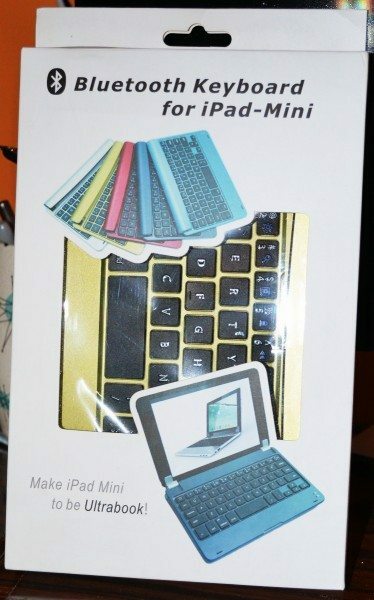 I bought this for the iPad mini 1 a year ago and use it almost daily. For the price, it’s not bad for texting throughout the day and entering passwords. Recently it’s started being weird about signing into my office’s network – the keyboard is paired and functional, but won’t allow my to type the login and password for network access. Don’t see how it can be a failure of the keyboard, so it must have something to do with the OS or that webpage. The non-standard keyboard layout still trips me up as I appear to use a lot of apostrophes while typing and hit enter instead.